If you do not wish to turn your Master File into a Business View, it is recommended that you save the Business View using a different name or preferably start by creating a new Master File by selecting New, then Synonym via Synonym Editor. Then, insert a reference to an existing synonym and continue to build the Business View. In this case, the Business View points to the cross-referenced Master File, and all of the actual fields and security information comes from the referenced file when the Business View is used in WebFOCUS tools (such as Joins and Defines) and in reports. Note: Impact Analysis searches Business Views in addition to FOCUS procedures. This enables you to see if changes in the original Master File will impact fields used in the Business View. For detailed information on Impact Analysis, see Analyzing Metadata and Procedures. From the Projects or Data Servers area, navigate to the Master Files folder where you want to create the Business View. Right-click the Master Files folder and select New, then Synonym via Synonym Editor. Provide a unique name for the new file and click Open or Create if in the Data Servers area. While in the Field View tab of the Synonym Editor, right-click the file name in the upper-left corner, select Insert, and then Reference to Existing Synonym. From the Insert Reference to Existing Synonym dialog box, select the synonym for which you want to create a Business View. For FOCUS multisegment files, you have the option to select the segment you want to reference. Select Business View from the Tools menu to open the Business View pane. You can also click the Business View icon from the Synonym Editor. Tip: Select Properties from the Tools menu to open the Properties pane and view additional information for items selected in the Business View pane. Use the Properties pane to change titles, descriptions, or field names. Items that cannot be edited are grayed out. In the Business View pane, right-click the file name and select Create Default Business View or New Folder. Select the Save or Save As icon to save the Business View as a Business View Master File. Note: The Business View Master File may be saved in a different application than the main files. 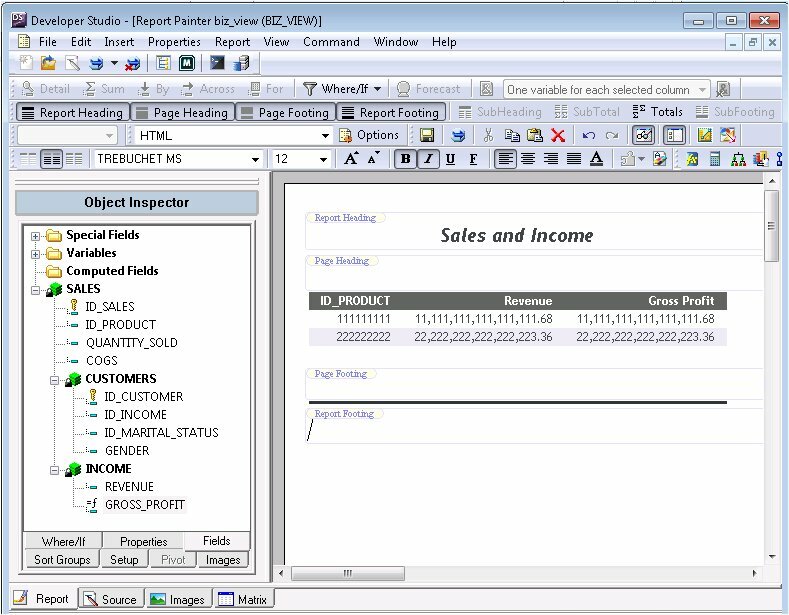 It is recommended that you create a Business View using the Synonym Editor as outlined in How to Create a Business View Using the Synonym Editor. However, the following is an alternative way to create a Business View using the Synonym Editor. From the Projects or Data Servers area, navigate to the Master Files folder where you wish to create the Business View and highlight the Master File to be altered. Note: You may create a Business View anywhere that you can select a Master File. Double-click the Master File or select Edit in Synonym Editor from the File menu. Note: When opening a Master File in the Synonym Editor, the tool opens to the last tab selected when the Synonym Editor was last accessed. Select Business View from the Tools menu. You can also click the Business View icon from the Synonym Editor. The Business View pane opens. The Create Default Business View option duplicates the segments and fields that are available in the Master File, and you can reorganize the view as necessary. The New Folder option creates a root folder to which you can add fields from the Master File on the left pane by selecting them and then dragging and dropping them inside the folder. You can create additional folders to create the structure you want. Select fields from the Master File on the left and drag and drop them to the appropriate folder in the Business View pane. Press the Shift or Ctrl key while selecting multiple fields. The selected fields appear in the Business View Tree tab. When you use the Save As option and you are working with FOCUS files, you will need to specify a DATASET in the Master File that points to the data file. If you use the Save option, the Business View will be saved inside the current Master File and the Business View will be visible when the Master File is opened in reporting tools. Select Close from the File menu to close to the Synonym Editor. All adapters for non-FOCUS data sources support retrieval requests against a Business View. You may access the Business View Master Files from all development areas of Developer Studio. 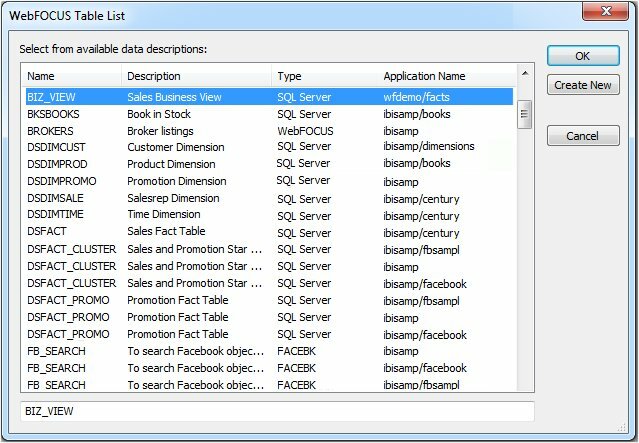 The Table List shows all available Master Files, including the Business Views that are available. The Description column shows a description from the Master File or the Business View file. The following image is an example of a Business View Master File in the WebFOCUS Table List, that appears when creating a report in the Data Servers area. This is also available in the Projects area, however, the Table List does not show remarks in the Projects area. When using a Business View Master File in Report Painter, only fields from the Business View are shown in the Fields list. The following image is an example of a Business View Master File in Report Painter. When using a Business View Master File in InfoAssist, only fields from the Business View are shown in the Fields list. The following image is an example of a Business View Master File in InfoAssist.